Web scraping tools automate web-based data collection. These tools generally fall in the categories of tools that you install on your computer or in your computer’s browser (Chrome or Firefox) and services that are designed to be self-service. Web scraping tools (free or paid) and self-service websites/applications can be a good choice if your data requirements are small, and the source websites aren’t complicated. However, if the websites you want to scrape are complicated or you need a lot of data from one or more sites, these tools do not scale well. The cost of these tools and services pales in comparison to the time and effort you require to implement scrapers using these tools and the complexity of maintaining and running these tools. For such cases, a full-service provider is a better and economical option. In this post, we will first give a brief description of the tools and then quickly walk through how these tools work so that you can quickly evaluate if these work for you. Web scraper, a standalone chrome extension, is a great tool for extracting data from web pages. Using the extension you can create a sitemap to how the website should be traversed and what data should be extracted. With the sitemaps, you can easily navigate the site the way you want and the data can be later exported as a CSV. Download and add the extension to Chrome using the link here. Data Scraper is a simple web scraping tool for extracting data from a single page into CSV and XSL data files. It is a personal browser extension that helps you transform data into a clean table format. You will need to install the plugin in a Google Chrome browser. The free version lets you scrape 500 pages per month, if you want to scrape more pages you have to upgrade to the paid plans. Download the extension from the link here. Scraper is a chrome extension for scraping simple web pages. It is easy to use and will help you scrape a website’s content and upload the results to Google Docs. It can extract data from tables and convert it into a structured format. You can download the extension from the link here. OutwitHub is a data extractor built in a web browser. If you wish to use it as an extension you have to download it from Firefox add-ons store. If you want to use the standalone application you just need to follow the instructions and run the application. OutwitHub can help you extract data from the web with no programming skills at all. It’s great for harvesting data that might not be accessible. OutwitHub is a free tool which is a great option if you need to scrape some data from the web quickly. With its automation features, it browses automatically through a series of web pages and performs extraction tasks. You can export the data into numerous formats (JSON, XLSX, SQL, HTML, CSV, etc.). WebHarvey’s visual web scraper has an inbuilt browser that allows you to scrape data such as from web pages. It has a point to click interface which makes selecting elements easy. The advantage of this scraper is that you do not have to create any code. The data can be saved into CSV, JSON, XML files. It can also be stored in a SQL database. WebHarvey has a multi-level category scraping feature that can follow each level of category links and scrape data from listing pages. The tool allows you to use regular expressions, offering more flexibility. You can set up proxy servers that will help you to maintain a level of anonymity, by hiding your IP, while extracting data from websites. Mozenda is an enterprise cloud-based web-scraping platform. It has a point-to-click interface and a user-friendly UI. It has two parts – an application to build the data extraction project and a Web Console to run agents, organize results and export data. They also provide API access to get the data and have inbuilt storage integrations like FTP, Amazon S3, Dropbox and more. You can export data into CSV, XML, JSON or XLSX formats. Mozenda is good for handling large volumes of data. You will need more than basic coding skills to use this tool as it has a high learning curve. After downloading the webscraper chrome extension you’ll find it in developer tools and see a new toolbar added with the name ‘Web Scraper’. Activate the tab and click on ‘Create new sitemap‘, and then ‘Create sitemap‘. Sitemap is the Web Scraper extension name for a scraper. It is a sequence of rules for how to extract data by proceeding from one extraction to the next. We will set the start page as the cellphone category from Amazon.com and click ‘Create Sitemap’. 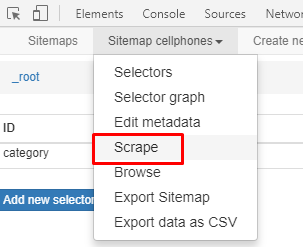 The GIF illustrates how to create a sitemap: Navigating from root to category pages Right now, we have the Web Scraper tool open at the _root with an empty list of child selectors Click ‘Add new selector’. We will add the selector that takes us from the main page to each category page. Let’s give it the id category, with its type as link. We want to get multiple links from the root, so we will check the Multiple box below. The ‘Select button’ gives us a tool for visually selecting elements on the page to construct a CSS selector. 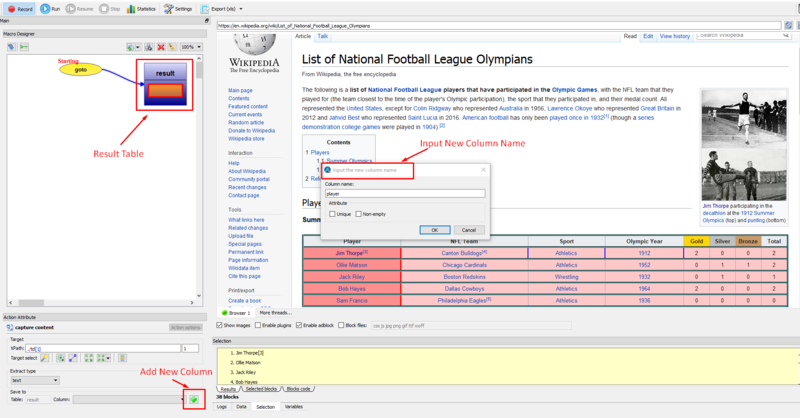 ‘Element Preview’ highlights the elements on the page and ‘Data Preview’ pops up a sample of the data that would be extracted by the specified selector. Click select on one of the category links and a specific CSS selector will be filled on the left of the selection tool. Click one of the other (unselected) links and the CSS selector should be adjusted to include it. Keep clicking on the remaining links until all of them are selected. The GIF below shows the whole process on how to add a selector to a sitemap: A selector graph consists of a collection of selectors – the content to extract, elements within the page and a link to follow and continue the scraping. Each selector has a root (parent selector) defining the context in which the selector is to be applied. This is the visual representation of the final scraper (selector graph) for our Amazon Cellphone Scraper: Here the root represents the starting URL, the main page for Amazon Cellphone. 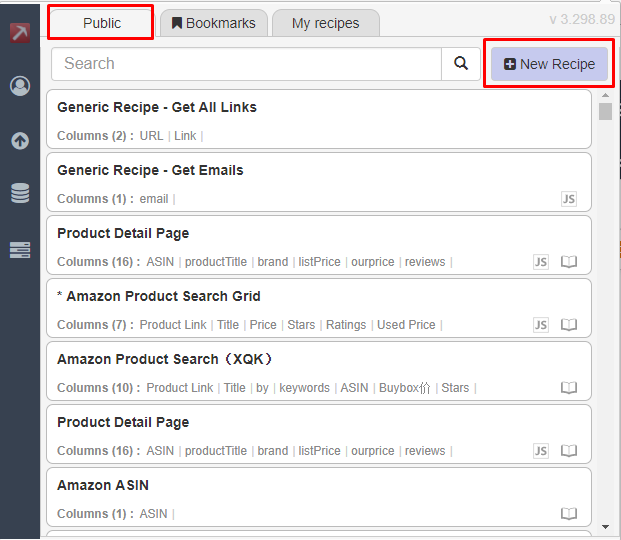 From there the scraper gets a link to each category page and for each category, it extracts a set of product elements. Each product element, extracts a single name, a single review, a single rating, and a single price. Since there are multiple pages we need the next element for the scraper to go into every page available. Running the scraper Click Sitemap to get a drop-down menu and click Scrape as shown below The scrape pane gives us some options about how slowly Web Scraper should perform its scraping to avoid overloading the web server with requests and to give the web browser time to load pages. We are fine with the defaults, so click ‘Start scraping’. A window will pop up, where the scraper is doing its browsing. After scraping the data you can download it by clicking the option ‘Export data as CSV’ or save it to a database. We’ll show you how to extract data from Amazon.com using the data scraper chrome extension. First download the extension from the link here Open the website that you need to extract data from. We’ll scrape the product details of air conditioners under the appliance category from Amazon.com. Right-click on the web page and click on the option ‘Get Similar (Data Miner)’. You’ll see a list of saved templates on the left side. You can choose any one of them or create your own one and run the template. To create your own template click on the option ‘New Recipe’ or choose from the generic templates under the option ‘Public’. 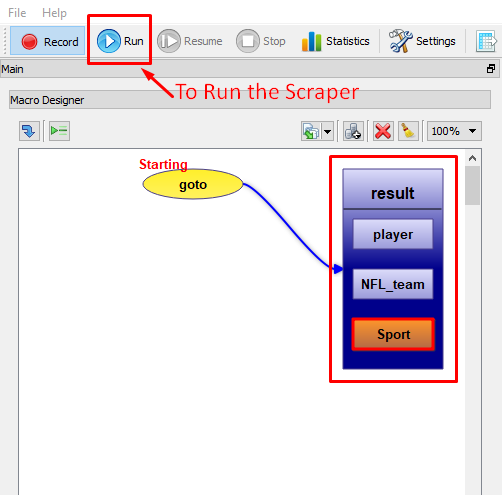 Data Scraper is user-friendly as it will show you how to create your own template step by step. You’ll get the output presented as a table: Then press on download and extract the data as CSV/XSL format. After downloading the extension open the website you need to highlight a part of the page that is similar to what to want to scrape. Right-click, and you’ll see an option called ‘Scrape similar’. The scraper console will open as a new window showing you the initial results, where you will see the scraped content in a table format. The “Selector” section lets you change which page elements are scraped. You can specify the query as either a jQuery selector or in XPath. You can export the table by clicking on ‘Export to Google Docs” to download and save the content as a Google Spreadsheet. You may also customize the columns of the table and specify names for them if you would like. After making customizations, you must press on the “Scrape” button to update the results of the table. All you need to do is enter the website you need to scrape and click on ‘Start Project’. Then click on the ‘+’ button to select a page or title. After selecting and naming all the fields you need you will get a CSV/XLSX or JSON sample result. Click on ‘Get Data’ and ParseHub will scrape the website and fetch your data. When the data is ready you will see CSV and JSON options to download your results. We’ll show you how to extract a table from Wikipedia using FMiner. 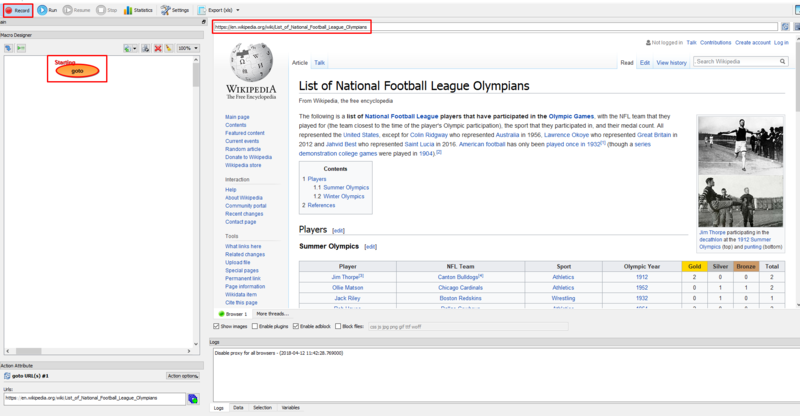 We are going to use the link https://en.wikipedia.org/wiki/List_of_National_Football_League_Olympians. First download the application at the link http://www.fminer.com/download/ When you open the application, enter the URL and press the button ‘Record’ to record your actions. What we need to extract is the table of Olympic players. To create the table, click on the ‘+’ sign that says table. Then select each row by clicking on the option ‘ Target Select’, you’ll see one whole row selected from the table. In order to expand the whole table, click on the option ‘Multiple Targets’ – this will select the whole table. 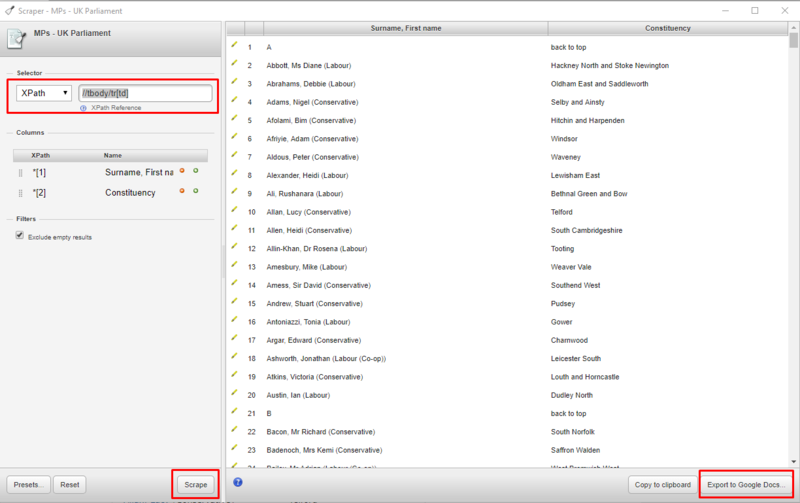 Once the whole table is highlighted you can now enter your new fields by clicking on ‘+’ sign (shown in the image below). After you have created the table click on ‘Scrape’. You’ll get a notification that the scrape has finished. Just click on ‘Export’ to save the data as a CSV or XLS file. To start, first, you have to sign up and create an account in dexi.io. It’ll then take you to the app https://app.dexi.io/#/. When you get there you can start by clicking on ‘Create New Robot’. It might take a while to get a hang of it, but there tutorials on how to create your first robot. If you need help you can check out their knowledge base. Dexi.io has a simple user interface. 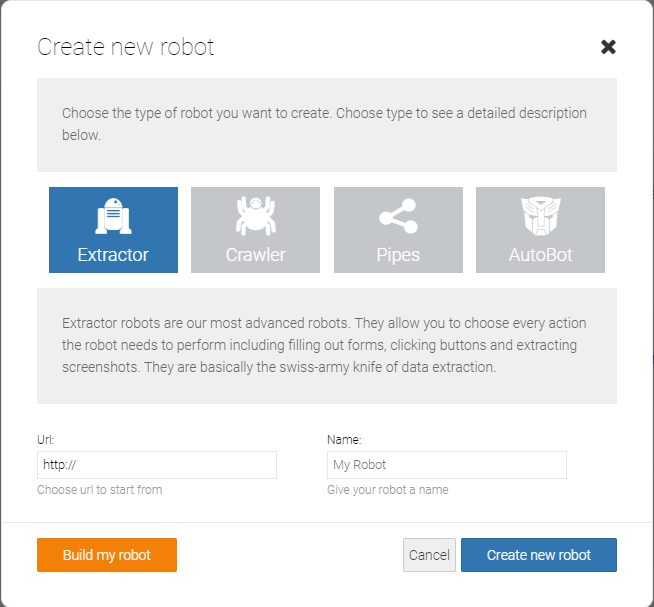 All you need to do is choose the type of robot you need, enter the website you would like to extract data from and start building your scraper. Even though these web scraping tools extract data from web pages with ease, they come with their limits. In the long run, programming is the best way to scrape data from the web as it provides more flexibility and attains better results. If you aren’t proficient with programming or your needs are complex, or you need large volumes of data to be scraped, there are great web scraping services that will suit your requirements to make the job easier for you. You can save time and get clean, structured data by trying us out instead – we are a full-service provider that doesn’t require the use of any tools and all you get is clean data without any hassles. Note: All the features, prices etc are current at the time of writing this article. Please check the individual websites for current features and pricing.